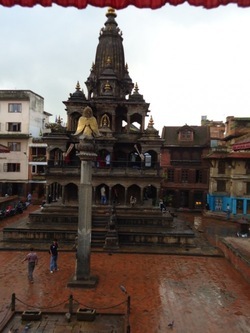 Considered as one of the finest stone monument in Kathmandu, the Krishna Mandir in Patan Durbar Square is made in Sikhara architectural style which is found commonly in Indian subcontinent. The temple was established in 1637 AD, as a copy of another Hindu temple of Lord Krishna present in Mathura in India, by Siddhi Narsimha Malla of Patan. The temple is completely made up of stone and the carvings are finer than the ones of other smaller Krishna temple at Patan Durbar Square which was built in 1723 by Yogamati, Siddhi Narsimha Malla’s great granddaughter. The temple is an outcome of merger of two distinct styles, the solidly formed southern Gupta Sikhara form and the open multi-storied style of Moghul. There are stone carvings of various gods and goddesses on the passage of the temple. The first floor of the temple consists of the stone images of Lord Krishna and his two consorts Radha and Rukmani and it is also the main area of worship. The second floor contains the image of Lord Shiva and it is said that the third floor which is empty now, used to contain a statue of Avalokitesvara. The temple is entirely built with stone and does not contain wood or bronze for any kind of support. It is also said that the entire temple was built with one stone alone. The temple is a Hindu shrine so entrance to non-Hindus are not given, however, the glimpse from the courtyard itself gives a pleasant picture of the temple and what it holds inside. The steps to the first floor of the temple are narrow and small and it is not common for the first timers to hit their head while climbing down the stairs. From the balcony of the first floor, one could look around the Durbar Square and the people queuing up for filling in their water pots at the nearby stone water sprout. The temple is adjacent to the Patan Museum because of which one could glance at the temple from the window of the museum. Viewing with a binocular from the museum window would give a clear view of the idols of Lord Krishna and his consorts enshrined in the temple. The temple is usually opened at all times and during the festival of Krishna Janmastami, large numbers of devotees throng at the square to offer worships to Lord Krishna. The temple is beautifully decorated with colorful papers, lights and flowers during the festival.